ReBuilder Medical & Hulda Clark Cleanses: How works The ReBuilder? ReBuilder's built-in microprocessor measures the electrical analog and digital impedance of your body. Automatically adjusts itself to your specific therapeutic needs beginning with the first healing signal. It knows if it is treating a 125 lb. woman or a 350 lb. man. If you use the ReBuilder® directly on your lower back, it knows that. If you are using it on your legs or hands, it knows that too. You would obviously need a different amount of signal for variations like these. This is a unique safety feature of the ReBuilder® and no other device offers this level of safety. 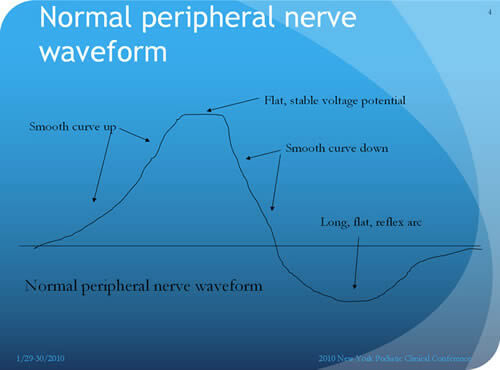 The ReBuilder® then sends out a "test" signal that represents the most common waveform for healthy peripheral nerves. (Diagram # 1) This signal goes from one foot, up the leg to the nerve roots in your back, down the other leg, to the other foot. It then waits for an echo -like response from this initial signal. This phenomenon is similar to the patella reflex when your doctor hits just below your kneecap with a little rubber hammer and your leg kicks out. 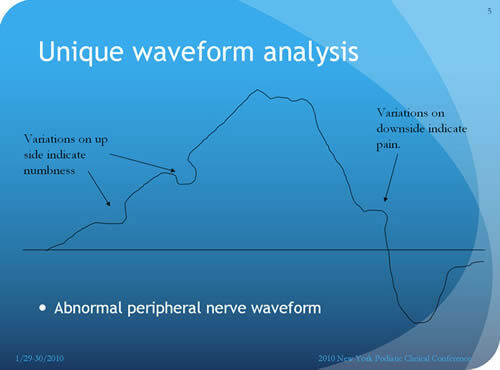 Just as a Cardiologist can take one look at the shape of the signal displayed on the EKG monitor above the patients bed in the hospital and diagnose what is wrong with the heart, we have been able to identify that the peripheral nerves have a very particular shape to its waveform, and we can diagnose the nature of the problem from analyzing that waveform. This feature is built into the ReBuilder® and processed by its internal microprocessor. The ReBuilder® then creates a compensating waveform (similar to the Bose headphones that cancel out the background noise on airplanes). 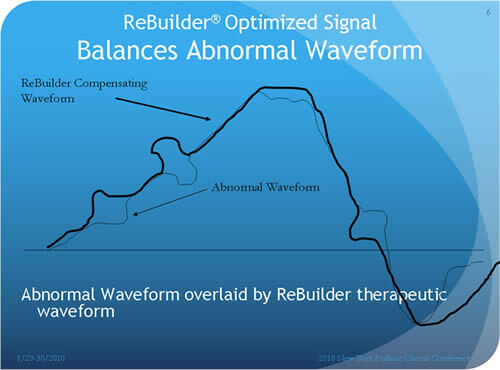 Where there is too much energy displayed, the ReBuilder® adapts the treating waveform to reduce that energy. Where the waveform indicates too little energy, it increases the energy in that area. This process goes on 7.83 times every second, sending a signal, analyzing the returning signal, creating a compensating signal, and sending this new signal. In effect, the ReBuilder® acts like a pacemaker works for your heart's electrical signals. If the pacemaker does not send exactly the right signal, then the four chambers of the heart may not pump in the right order and if the signal is too fast or too slow, the heart stops. So, too, the ReBuilder's precisely controlled waveform coaxes your nerves to transmit their signals in the proper order. Although essentially similar to TENS relative to the FDA's regulations, the ReBuilder's signals are vastly more controlled and precise. You can think of the ReBuilder® as a pacemaker for your nerves. Diagram # 1, a normal waveform. Diagram #2, an abnormal waveform. When used at bedtime, most patients report that they can sleep better. They also report a gently "lifting of the fog" that can clear their mind and improve their memory. They also report a lessening of pain from other causes like arthritis, sprains, headaches, etc for a few hours. The ReBuilder's signals, (as they cross the synaptic junctions in the nerve roots of the lower back to get from one leg to the other), create a small electromagnetic field that is sensed by the nerves in your central nervous system (spine) and a signal is uploaded to the brain to let it know what is happening in the lumbar area. The brain then releases endorphins, internal pain relievers that travel via the blood stream to all parts of the body, and these endorphins temporarily relieve pains in other parts of the body and helps improve your mood. These endorphin modulated benefits are palliative, and only last for about 4 hours, but can offer additional welcome relief. The ReBuilder® is truly a medical marvel! More information about the ReBuilder® in FAQ Page, click here.